With over 40 years experience within the field of filtration we have been able to bring together a range of filtration products that we feel offer exceptional value for money and yet still meet the criteria of high performance and exacting standards. The majority of these products are of UK or European manufactured origin which we feel helps us to maintain and control the standards that we have set. The products that we have available make up a range which is complimentary to the top branded products that we offer. These products are market driven and offer what we consider to be the best option where performance is important and economics must be considered. Available in polypropylene, polyester and nylon from 1 to 1000 um. All standard industrial sizes are available Extended life bags. Increased thickness of the filter media can increase lifetime by up to 5 times that of a standard bag. The filtration mechanism employed within filter bags allows high flow rates and high dirt holding capacity, this combined with low maintenance cost and quick change-out makes bag filtration an extremely cost effective means of liquid filtration. 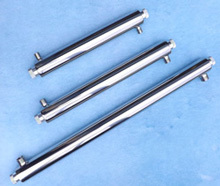 Bags are available to suit most common filter housings. 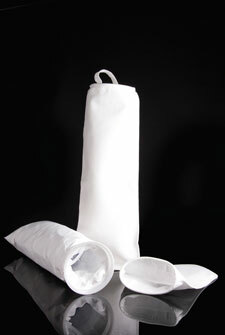 Felt filter bag materials are made from synthetic fibres in polypropylene or polyester. The proper combination of fibre diameter, weight and thickness results in an economical depth-type filter media. Polypropylene and polyester bags are supplied with a glazed finish to reduce fibre migration. These bags have a nominal micron rating. Monofilament mesh is offered in nylon and is a woven material. Each thread is a single filament. The openings are square. They have excellent strength and may be cleaned and reused. Filter efficiency is 90% or more.